The 12 gauge is not your run of the mill firearm. 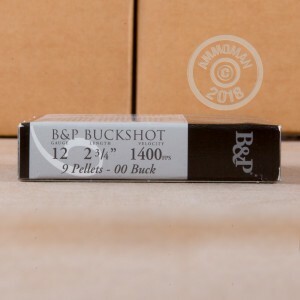 Putting out incredible amounts of lead at high velocity, this shotgun is phenomenal for hunting, self defense, sports shooting, and military and law enforcement applications. With this all purpose shotgun, you have everything you need in a close range firearm. 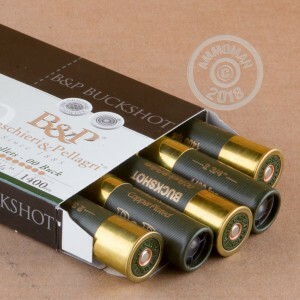 Baschieri & Pellagri was founded in Italy in 1885 and is dedicated to making high quality, precise, and accurate ammunition. Experimenting with different components, this fine Italian company developed the first white, smokeless gunpowder. Each hull in this 10 round box measures 2-3/4" in length and carries a 1-1/5 ounce payload of 00 buckshot. With high quality ammo from such an esteemed and established company, you have the shells you need to go hunting or protect your family.